Damien Oliver has win his ninth Scobie Breasley Medal for riding excellence in Victoria. 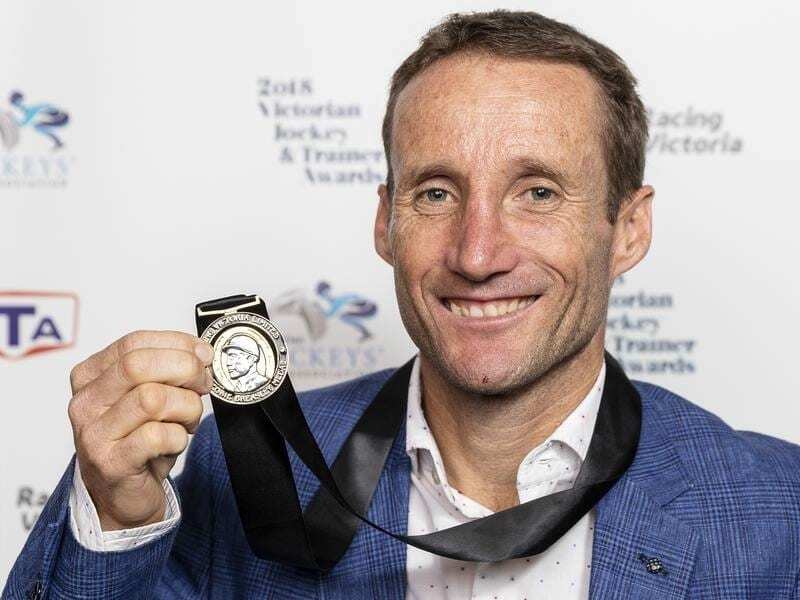 Champion jockey Damien Oliver has claimed a ninth Scobie Breasley Medal for excellence in the saddle, 22 years after he won the inaugural award. The Scobie Breasley Medal is awarded to the jockey judged by Racing Victoria stewards on a 3-2-1 point basis for what they believe to be the best ride of the day at each Melbourne metropolitan meeting throughout the season. The 46-year-old Oliver, who finished fourth on the Melbourne premiership, polled 54 votes to claim the award which was presented in Melbourne on Monday. “I’m a little surprised,” Oliver said. “It wasn’t a good start to the season and the spring wasn’t great either, but I had a great autumn. “There’s a lot of great jockeys coming through along with the older guys and the kids are a lot further ahead than what I was. Oliver’s other Scobie Breasley Medals came in 1996, 1999, 2001 (joint with Brett Pebble), 2002, 2003 (joint with Kerrin McEvoy), 2004, 2014 and 2015. He finished 10 votes ahead of premier rider, five-time Scobie winner Craig Williams, with Lane third on 36. Joseph O’Brien took out the Fred Hoysted Medal which goes to the trainer with the outstanding individual performance over the 12 months. Irishman O’Brien became the youngest trainer to prepare a Melbourne Cup winner when Rekindling won in 2017, beating Johannes Vermeer trained by O’Brien’s father Aidan..
Victorian premiership winner Damian Lane was voted by his fellow riders as the ‘Most Valuable Jockey’ in a new category. Premier metropolitan apprentice Ethan Brown also won the inaugural ‘One To Watch’ award. The Colin Alderson Rising Star Award for Victorian trainers under 40 who have held a licence for seven years or less went to Wodonga-based Craig Widdison who went out on his own in November 2016 after beginning his career in partnership with Peter Morgan.